A cost estimate is a projection of a future occurrence. At its most basic, cost is price times quantity, and in any estimate either price, quantity, or both, are uncertain to some degree. When a cost projection includes hundreds, thousands or more uncertain elements, it’s easy to understand why some sort of cost risk analysis has long been considered the best way to calculate how much to reserve in contingencies against overruns. 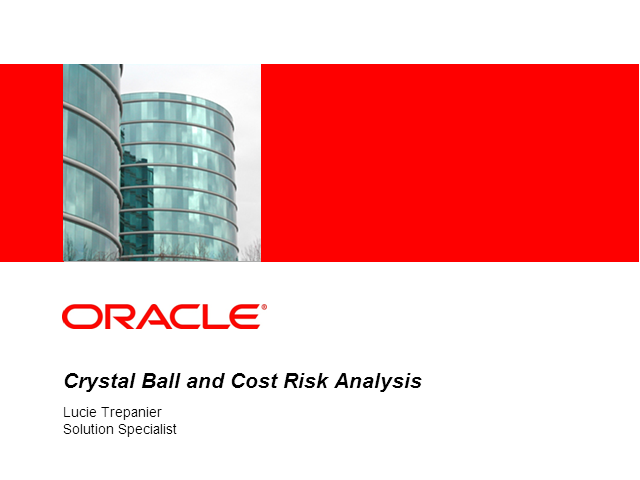 In today’s presentation we will look at the risk assessment work that goes into a complete cost estimate, the related business challenges and the Oracle solution. Crystal Ball is a powerful enabler in the modeling & analysis of performance and its associated risk and opportunity. Process Performance Models relate behavior and interaction of processes to an outcome order to predict future performance and manage risk. The purpose of this presentation is provide an overview of a suite of highly effective Process Performance Models developed and deployed at Raytheon Integrated Defense Systems using Crystal Ball. To be included in this presentation are Raytheon’s Systems Lifecycle Analysis Model (SLAM), Scheduling Analysis of Variability Engine (SAVE), Predictive Cost Model (PCM) & Effort based on Size & Productivity (ESP) Process Performance Models. This webcast will give the viewer a tour of the new features and capabilities in Oracle Crystal Ball, as of release 11.1.2.1.000. Over the last two and a half years, Oracle has invested substantial development resources into Crystal Ball, adding to, and improving all aspects of the solution. The core capabilities of predictive modeling, risk modeling and decision modeling have been strengthened and expanded. We’ve solidified our traditional spreadsheet-based foundation with support for the latest Excel and Microsoft release. Additionally, by leveraging Oracle product development resources and know-how, we’ve added new unique integration features that take Crystal Ball well beyond the spreadsheet. Monte Carlo simulation is a widely used technique for dealing with business uncertainty in applications like cost estimation, continuous improvement, engineering, and business forecasting. In this 10 minute segment, we illustrate why simulation is useful for these applications, and demonstrate how it works on a very simple cost-estimation model. The example shows how a single estimate of project cost is naïve regarding expectations and downside exposures of the company to the project. Continuous improvement is currently being used by world class companies to improve profitability and gain competitive advantage. In this short presentation, variability is identified as the culprit in many companies’ poor operations. Variability has historically been difficult to deal with as companies try to model and forecast the impact it has on their processes. Crystal Ball is demonstrated to empower companies to estimate variability, model and forecast its impact on their processes, and ultimately enable them to design their operations to effectively mitigate the negative impact of variability on their bottom line. Tandem y Oracle-Crystal Ball los invitan a participar al próximo seminario online sobre "Cómo optimizar portafolios estratégicamente". Cuando el nivel de incertidumbre es alto y los tiempos y presupuestos son acotados se torna fundamental decidir de manera eficiente. Los ejecutivos se enfrentan a un dilema habitual: ¿cómo asignar recursos escasos a diferentes tareas, activos, marcas o productos con resultados inciertos? El ejecutivo debe decidir cómo asignar tiempos, presupuesto y personas a diferentes proyectos, programas, productos, canales, regiones, filiales o unidades de negocio, de manera de mantener balanceada la operación y obtener los mejores resultados posibles a un menor costo. El análisis de portafolios es un método que ayuda a evaluar alternativas estimando el impacto sobre la performance global de la compañía. De esta manera, permite seleccionar la combinación de alternativas que optimiza los objetivos estratégicos.
. Los conceptos claves del Análisis de Portafolios.
. Decisión de Optimización de proyectos maximizando la eficiencia de los recursos en contextos de alta incertidumbre.
. Los beneficios de la optimización de portafolios utilizando Crystal Ball. El evento será presentado por Federico Esseiva, Director de Tandem Soluciones. Forecasting, particularly as part of any organization’s planning process, is a key factor in the organization’s success. If one considers a plan as both what the organization would like the future to be, as well as a roadmap to get there, then the forecast upon which the plan is built, is a critical starting point on that road to success. This presentation will focus on how to create forecasts that are both comprehensive and accurate so that the execution of the plan throughout the year does indeed contribute to the organization’s key business requirement of improving revenue and margin. How different does a forecast have to be for you to make a different decision? Accuracy in forecasting at all levels of the organization ultimately rolls up to more certainty in financial forecasts, resulting in fewer surprises, more credibility and better profits. So how do you ensure your organization is delivering the most accurate forecast possible, especially when historical data is limited? Industry experts point to Time Series Forecasting as the answer for businesses today. Tolerance stackups are fundamental engineering design tools which ensure the fit and function of products. Often times, the design engineer estimates the dimensional target values based on his/her experience, which tends to be ambiguous. What is difficult for them to account for is actual part variation. As a result, the defect rate of new products often comes as a surprise. Oracle Crystal Ball enables one to pick nominal values that will minimize the defect rate of new product launches. The ability to estimate reserves stochastically – mainly with Monte Carlo simulation - is a critical part of Upstream Oil and Gas E&P. While Monte Carlo simulation works well for producing the probabilities, using spreadsheets as the modeling environment can be challenging. Customers tell us that they waste time manually linking and aggregating spreadsheets; that they can’t perform a stochastic estimate at any but the lowest zone level; that it’s difficult to report and share results from multiple analysts. Oracle’s solution answers these requirements. It keeps Monte Carlo simulation with a spreadsheet user interface, for the easy frontline user experience, and combines it with a robust and scalable database for storage, aggregation and reporting. This short webcast will show you how you can move beyond today’s spreadsheet challenges and focus on truly understanding and managing the uncertainty in your reserves to optimize value. Oracle Crystal Ball is the leading spreadsheet-based application suite for predictive modeling, forecasting, simulation, and optimization. It gives you unparalleled insight into the critical factors affecting risk. With Crystal Ball, you can make the right tactical decisions to reach your objectives and gain a competitive edge under even the most uncertain market conditions. To ensure our customers have access to the best and brightest information on key industry topics, we are delivering presentations from Industry and Product Experts, Existing Customers, and Thought Leaders. Complimenting the presentation calendar is an ongoing set of Product Demos and Self-Service Tutorials delivered by Oracle Product Experts. The Oracle Crystal Ball Channel is the home of Informed Business Decisions.